Coro do Teatro Nacional de São Carlos, Orquestra Sinfónica Portuguesa / Leo Hussain. Stage director – Nicola Raab. Teatro Nacional de São Carlos, Grande Auditório do Centro Cultural de Belém, Lisbon, Portugal. Sunday, February 4th, 2018. Lisbon has been home to several notable Elektras over the years. Indeed, at the first local performance back in 1954 the title role was sung by none other than Inge Borkh. As the main house of the Teatro Nacional de São Carlos is somewhat intimate, today the house forces decamped to the larger Grande Auditório of the Centro Cultural de Belém. It’s a handsome venue with good sightlines, comfortable seats and a warm acoustic. The pit is actually quite deep which gave the cast additional room to be heard over the band. I caught the second performance of a run of three. Today’s Elektra was initially advertised as a semi-staging – a good solution for a house that isn’t the most financially endowed. Yet what we got, was much more than that. 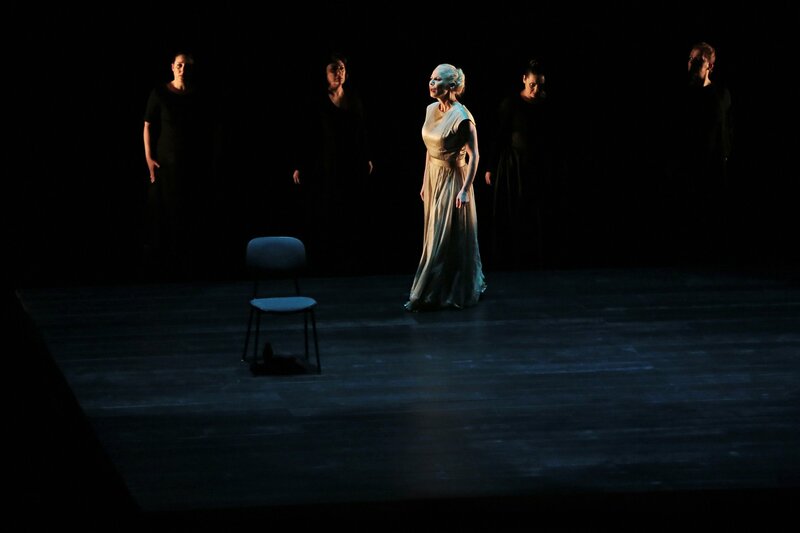 Entrusted to Nicola Raab, a young Bavarian director rapidly making a name for herself, we saw a piece of theatre that left food for thought and reflection. As we entered the auditorium, we saw a large wooden square in the centre of the stage. This is later revealed to be Elektra’s hovel. The other family members (except for Orest) enter and take their places behind music stands outside of the wooden square, Elektra being the only family member who does not have one. As the evening develops, the music stands become left behind, occasionally abused, as were a few chairs thrown around. 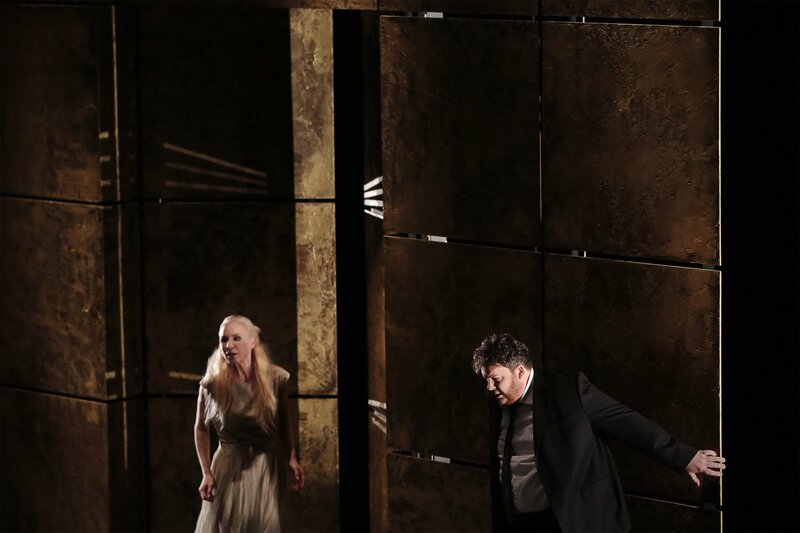 Only the siblings are able to enter Elektra’s square, while Klytämnestra conducts her scene from just outside it. A large door behind the square adds visual interest, occasionally opening to reveal a void behind or Klytämnestra’s bloody handprint as she expires. As a framework, it’s an interesting one – Elektra’s trauma confining her to a space that no one else can reach. And yet, it did seem perhaps inconsistent in approach. Especially so – due to Elektra’s isolation – with characters having to permanently deliver their lines to the front rather than to each other. Interesting how the servants gathered round just as Orest revealed himself to his sister – a nod to Chéreau’s staging perhaps. It was also wonderful to have the house chorus singing their off-stage lines from the rear of the auditorium, bathing the room in waves of rapturous shouts. On the whole it was a clever solution, much more than a semi-staging but perhaps lacking the intricacies of a fully-staged one. 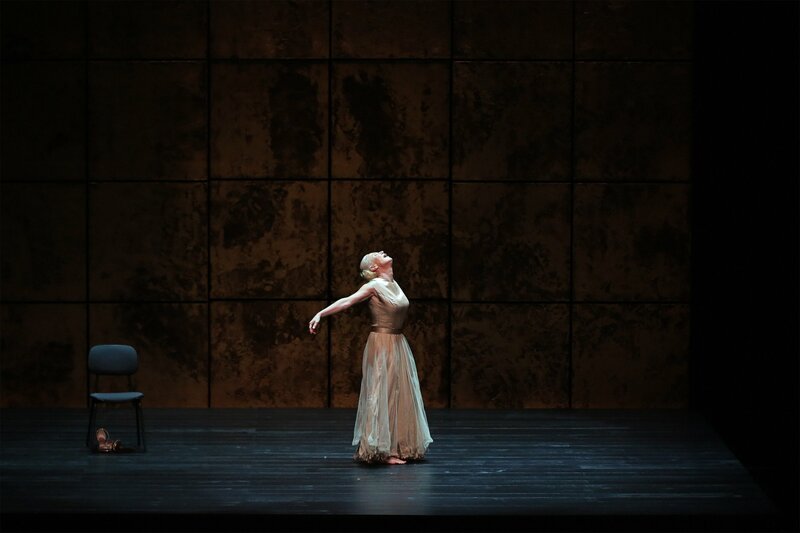 Nadja Michael was a dedicated Elektra. She made it to the end and the text was always clear. It started promisingly enough, her opening ‘Allein!’ originating in a warm, chesty contralto. Sadly it was downhill from there. She spent the entire performance a semitone (at least) flat, the couple of high Cs not even close. The voice seems forced to provide additional resonance, being made artificially loud and she gave everything at two dynamics – forte and fortissimo. The recognition scene lacked any sense of tenderness, the embarrassment felt in ‘ich glaube, ich war schön’ completely missed. She also suffered a few memory lapses. While Michael deserves our admiration for taking on this Everest of soprano roles, unfortunately it wasn’t easy to listen to. The audience gave her a warm, encouraging ovation at the end. Allison Oakes sang Chrysothemis with a big, youthful soprano and a penetrating, occasionally strident top. She sang her ode to childbirth with generous force, the voice pinging into the house with ease, although perhaps lacking the ultimate smoothness of line. Indeed, I wondered whether she may in fact be graduating to the title role soon. James Rutherford brought a lieder singer’s attention to the text as Orest, his diction absolutely immaculate. The voice had a handsome warmth in the bottom and middle, although the top was somewhat dry. Lioba Braun was an absolutely magnetic Klytämnestra. The voice with a rare beauty, her acting encapsulating the queen’s desperation to find a way out of her nightmares. Even in this semi-concert setting, she was utterly compelling and the ease on the G-sharps on top gave her Klytämnestra a beauty among the horror. Marco Alves dos Santos was a youthful Ägisth – believably a younger lover to Klytämnestra. His tenor had an ease of production as well as being extremely well-placed, the tone carrying easily through the house. The remainder of the cast was made up of young, Portuguese singers who also demonstrated excellent diction. I was particularly impressed by Cátia Moreso’s warm, fruity mezzo as the Zweite Magd and Carla Simões’s crystalline Vierte Magd. The house orchestra, the Orquestra Sinfónica Portuguesa played phenomenally well for Leo Hussain. He found a transparency to the textures, voicing the wind and string chords in a way that brought out the strangeness of the harmonies. As Klytämnestra recounted her sleepless nights, the low brass seemed to emerge from the darkest night of the soul. Despite the lightness of the textures, Hussain never shied away from bringing out the violence of the score – the murders felt visceral in the big, loud, physicality of the sound, the rhythmic impulsiveness felt dangerously present. Similarly, he felt alive to the dance rhythms that abound in the score. The ladies and gentlemen of the orchestra played like heroes for him. The sound light and delicate where required and full-blooded and warm where necessary. The chorus was excellent in their brief interjections, the tone full and well balanced. 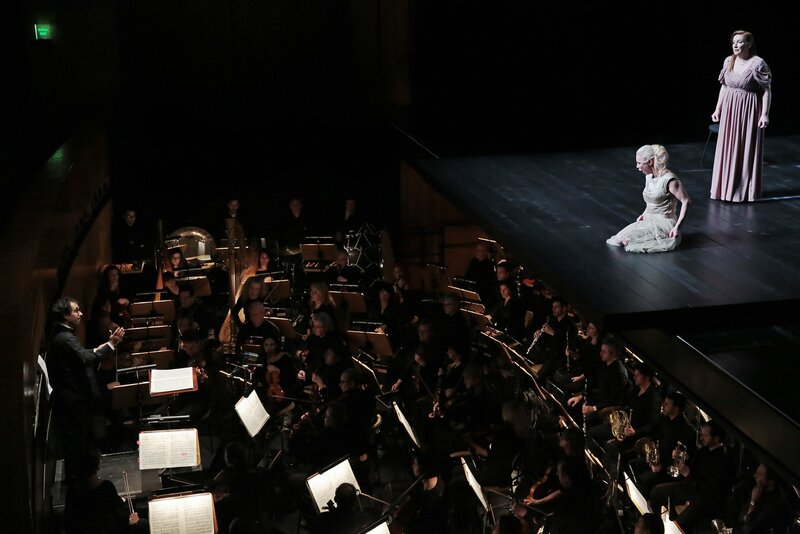 There was so much outstanding in this Elektra – the playing of the orchestra, Hussain’s conducting, Braun’s Klytämnestra and dos Santos’ Ägisth as well as the supporting cast of youthful Portuguese singers. Oakes’ Chrysothemis and Rutherford’s Orest were also very good. It would be easy to dwell on the disappointment that came with the performance of the title role but the truth is that this was a performance that was worth travelling for by a group of dedicated artists who rose to the challenge of one of the most difficult works in the repertoire. I totally agree with your review. There were a couple of situations where Elektra was a disappointment. First, when the climax is reached and it’s heard Elektra’s first shout “Orest”. Normally, it’s hair-raising moment that failed to deliver the expected punch. I was also expecting more from the end of Elektra/Klytammestra confrontation: “und wer dann noch lebt, der jauchzt und kann sich seines Lebens freun!”. The “lebt”, “jauchzt” and “freun” sounded artificial and even painful. At one point, I thought that it could be due to the venue’s acoustics. Yet, as opposed to Elektra, Chrysothemis sounded much more natural. Finally, at the end Elektra didn’t collapse (as everyone was expecting), and I couldn’t hear the last syllable from “tanzen” (low F#). After Chrysothemis final words, Orest shows up with the axe on his hands (didn’t Elektra forget to give him the axe?). Maybe there were too high expectations after Nadja Michael’s fantastic role as Salome in ROH. An amazing performance from the Orchestra with a very good cast! Overall, it was an excellent evening.